Miami is one of my favorite destinations to visit mainly because of its beautiful location, great night life and land based casinos. I’m a big blackjack fan so I always like to see how good I’m at the tables. Miami casinos offer luxurious and entertaining blackjack gaming environment so I’m their huge fan. However, when I’m lazy and don’t want to spend a few hours driving to Miami, I visit the gambling world of Miami virtually via my computer. So no wonder why Miami Club Casino is also one of my favorite online casino destinations to visit. The dark purple design is very inviting; it’s like a red carpet waiting for me to come and enter the virtual doors of the casino. Miami Club Casino is an online casino established in 2012 and powered by WGS Technology software. The casino is operated by Deckmedia N.V., and it is licensed and registered under the jurisdiction of Curaçao. One of the things I like about the casino is its nice blackjack game variety. I also like the new player bonus and how it treats its customers. The casino is also available on the move which is also a big plus. With seven blackjack games in total, Miami Club Casino is the best choice for blackjack players like me. US Blackjack and Atlantic City Blackjack are my top favorites not just because I live in the United States, but also because I like their set of rules and how the games are played. Other blackjack options include Classic Blackjack, Perfect Pairs Blackjack, European Blackjack, Progressive Blackjack and Down Town Vegas Blackjack. The games were created and developed by WGS Technology so even though they are simple in terms of graphics, the games are clearly displayed and give you a crystal clear view of the entire action. Besides blackjack, the download and instant play casino libraries of Miami Club Casino feature more than 150 online casino titles categorized into slots (3 reel, 3 reel bonus, 5 reel, 5 reel bonus, 7 reel slots, progressives and traditional slots), table games, roulette games, single hand, 2-4 hand and mega multi-hand video poker variants and specialty games. I usually play slots like Gladiator’s Gold, City of Gold or Lucky 7s when I want to have a short break. I also want try my luck in video poker from time to time by playing games like Aces and Faces, Double Joker and Tens or Better. Some of the games are available in practice mode, but I prefer to play with real money so I can win real cash. I’m not that big fan of online casino bonuses, but I do like to claim a bonus from time to time so I can double or triple my bankroll and play blackjack games with more money. There aren’t any blackjack-only bonus offers at Miami Casino, but the first time I joined in I was offered a welcome bonus I could use to play blackjack. The welcome bonus offer is still available to new players and it is $800 free welcome bonus given over the first eight deposits up to $100. For example, I deposited $100 and got $100 on the house so I started playing with $200 bankroll. The wagering requirement of the bonus is 20 times the deposit plus bonus amount and wagers on all blackjack games contribute 10% towards meeting it. The welcome bonus package can also be used to play other casino games like slots or video poker, but each game has its own percentage contribution toward meeting the playthrough requirement. In addition, Miami Club Casino hosts Slot Tournaments and slot fans can join in and win a share of the amazing $10,000 prize pool. Loyal players like me are also rewarded at Miami Club Casino. They are given comp points for their regular play and 1,000 comp points can be converted into $1 in cash. There are also six loyalty levels: Flamingo, Downtown, Bay Front, South Beach, Ocean Drive and Millionaire’s Row. I also visited Miami Club Mobile Casino on my iPhone and I have to say that the casino works perfectly on small screen. Players that own iPad can also get access to the games and play them wherever they are, regardless of the time. Blackjack is one of the games I regularly play on the move and I’m very satisfied with the graphics and display features. 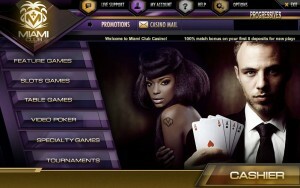 Miami Club Casino is also available for Mac users via the instant play web-based casino version. As a blackjack player from the United States I cannot use each and every banking method to make a deposit to and cash out my winnings from Miami Club Casino. Thankfully, the casino offers suitable reliable, fast and simple deposit and banking options. To be able to make a deposit I used my credit card which is also available as a deposit option to international players. Other deposit methods include Neteller, Skrill, EcoCard and Quick Cash. Withdrawals, on the other hand, are processed within up to 72 working hours. Suitable cashout methods available to US players are wire transfer and check payout. I used wire transfer to cash out my money, but I had to pay a $60 fee. I got my money is about 10 days. Check payouts are completed in five days and incur a $30 fee. Other withdrawal methods are Skrill, Neteller and EcoCard. To sum up, Miami Club Casino has always been my favorite online casino place to visit. I like the software and games, especially the blackjack library. Moreover, I like the fact that the casino is available on the move and US players can also access the games. All in all, it is an excellent, safe and secure online casino.